Tailor-made for the great Lily Tomlin...Yeah, the circumstances are contrived, but easy enough to accept as long as they’re forcing interesting dynamics into seriocomic confrontation. 79 min. Sony Pictures Classics. Director: Paul Weitz. Cast: Lily Tomlin, Julia Garner, Marcia Gay Harden, Sam Elliott, Laverne Cox, Judy Greer, John Cho. 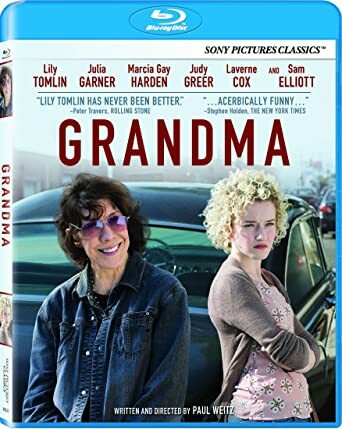 "You know, you need to be able to say, ‘Screw you’ sometimes.” That’s the hard-earned lesson a grandmother passes down to her granddaughter in Paul Weitz’s Grandma, tailor-made for the great Lily Tomlin. At a compact 80 minutes, Grandma is built only to go so far, but with a willful briskness—and a grand old dame star—that propels it along. Like the not-so-compact 1955 Dodge Royal Lancer Tomlin’s character drives, Grandma suffers worrying engine trouble, but unlike the car, the cinematic vehicle keeps revving back to life, enough to arrive soundly at its destination. Tomlin plays Elle Reid, a feminist poet and sometime professor whose twilight years find her stewing in depression and anger. Elle’s 38 years of precious memories of longtime companion Vi have vied with current girlfriend Olivia (Judy Greer) and won: Elle ruefully dumps her decades-younger former student at the film’s outset. Just at this vulnerable moment, Elle’s granddaughter Sage (Julia Garner of The Perks of Being a Wallflower) arrives to beg a loan of $630 to pay for an abortion. Die-hard feminist Elle doesn’t think too hard before committing to help, but the momentarily cash-and-credit-poor Elle will have to call in every last favor, bite every last bullet, and maybe even bury a hatchet or two to find the money. The tightly contained road trip that follows lines up an increasingly impressive series of guest stars to tangle with Tomlin and slowly unfold Elle’s backstory. After making a scene with a barista (John Cho) and shaking down the baby daddy (Nat Wolff), Elle plies friends of varying degrees (the late Elizabeth Peña, Laverne Cox) before crawling to the real hard cases: the mystery man (Sam Elliott) in this lesbian’s closet and, in a foregone conclusion, the woman between Elle and Sage, “Ma” Judy (Marcia Gay Harden). The early scenes self-consciously work to establish Elle’s cranky bona fides, from the As Good As It Gets playbook of no-nonsense, potty-mouthed elders. As expert as comic performers come, Tomlin can toss off this shtick in her sleep, but once she’s going to toe-to-toe with Elliott (who’s having a heckuva year in movies and on TV) and the always-on-fire Harden, it’s game on for the stars and writer-director Weitz (About a Boy, Admission) , and at last we get the deeply felt, nuanced performances promised by the film’s nascent Oscar buzz. Yeah, the circumstances are contrived, but easy enough to accept as long as they’re forcing interesting dynamics into seriocomic confrontation. Grandma looks at abortion from both practical and emotional vantage points, without dwelling on the politics (though those are cartooned in a silly exchange outside a clinic). In point of fact, the pro-choice picture is about life choices in general: the mistakes, the canny choices, the good luck and the bad that we tend to make for ourselves. Whenever this reflective rubber meets the narrative road, this road picture gets traction for Tomlin and company, and for the audience. Besides, if Grandma were nothing more than an excuse to make a picture with national treasure Tomlin in every scene, that’d be enough for most of us. Sony send home Grandma in a Blu-ray special edition that features a beautiful, richly hued, convincingly filmic transfer and top-notch audio. Detail is outstanding, with well-calibrated contrast, solid black level, and discernable textures, handily handling even the toughest of visual challenges (the fine mesh of a screen door) with no sign of digital artifacts. The DTS-HD Master Audio 5.1 mix doesn't get tested much by the source material, but it's a definitive presentation nonetheless, with a bit of ambience to go along with the gently effective score and always well-prioritized dialogue. First among the extras is a feature commentary with Lily Tomlin, Sam Elliot, Julia Garner and director Paul Weitz that entertainingly brings together in one room the principal cast and their director to talk through their experiences making the film and, in Weitz's case, initiating the project. Tomlin discusses what she brought to the set from her own life, and we get a fairly intimate account of life on the set from all involved as they play off of each other. The surprisingly in-depth "A Family Portrait: Making Grandma" (25:15, HD) features production stills, film clips, and extensive interview clips of Weitz, Elliott, Garner, Judy Greer, producer Andrew Miano, and producer Terry Dougas. "Q&A with Lily Tomlin, Sam Elliott and Director Paul Weitz" (20:58, HD), moderated by Pete Hammond of Deadline, offers yet more discussion, including that prompted by audience questions following a screening. Rounding out the disc is the film's "Theatrical Trailer" (2:06, HD). All site content © 2000-2019 Peter Canavese. Page generated at 04/17/2019 06:39:21PM.